There are days when you do not want to think too much about finding the right wine for dinner. Those days you should bring out a bottle of Pinot Blanc, preferably with a sizeable dose of Auxerrois, which gives roundness and body. 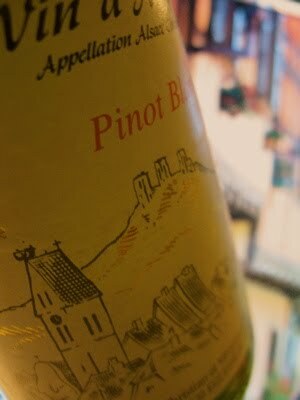 If this Pinot Blanc is from Eguisheim, you can be sure that the wine is tight, rich and well-made. In addition, if the name on the label is Hebinger, you should expect a wine of quality! 2007 Pinot Blanc has a nice aroma of lemon, yellow apple and a touch of cabbage. The taste is medium bodied, complex and completely dry with minerality and wonderfully refreshing acidity, which is firm without being green. A bit like a really good Grüner Veltliner, if the comparison is allowed. Price: € 5.50.